Several options are available for this workshop. Follow links for lesson plans. *The skeleton making is too difficult for younger or less able classes (including some year 4s); the dinosaur colouring (option 2) is recommended instead. Price: £279 per day. Max. 32 children per class. Fossils and bones takes children back in time hundreds of millions of years to when life was very different - a time when spiral shells and crab-like creatures swam the oceans, giant dragonflies flew among giant horsetail trees, and the land was stalked by huge reptiles with long necks and tails, terrifying teeth, and deadly horns. After the lesson (at the end of the day or during lunch if that is more convenient) I will have a variety of fossils for sale at low prices (10p, 20p, 50p, and a few for £1). These may include leaves, horsetails, shells, ammonites, belemnites, coral, crinoids, and sharks' teeth (depending on what fossil hunting trips I have been on recently). Children in teams which win the games will each get a fossil as a prize. I will also have some dinosaur/reptile toys for 50p-£2. Learn what a fossil is, how a fossil is made. Volunteer children stand at the front and handle four mystery dinosaur fossils (vertebra, tooth, shell fragment, and dung). The class tries to guess what they are. Then, in pairs, all children handle three real fossils (ammonite, leaf/horsetail, shark's tooth). I have lots of other interesting fossils children can look at if time allows. Discuss what each fossil is, what features it has. 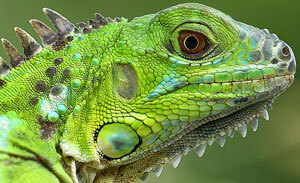 If appropriate for the class, discuss adaptation and evolution, and the enormous history and diversity of life on earth (with photos to illustrate). Children are divided into 5 teams, and go to 5 tables in turn with 4-5 minutes at each table. At each table they have to identify fossils (using pictures of the living animals or photos of fossil skeletons). Children look at 20 or 25 fossils, depending on year group. 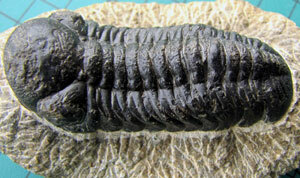 Many of the fossils are copies, as the originals are of high quality and value, and in some cases they are very famous - e.g. the Archaeopteryx (the first bird) and the Compsognathus (small dinosaur). Most of these fossils are provided as plaster casts for children to paint later on. 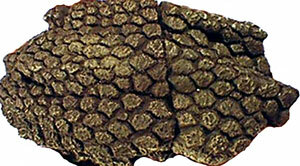 If you like, for each fossil children can also identify another feature, e.g. habitat (land, water, air), skeleton type (vertebrate or invertebrate), or adaptative feature (e.g. shell for protection, sharp teeth for eating, strong bones for supporting weight). To see all the fossils in the game click here. 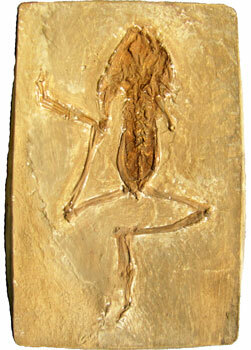 Children will paint an accurate fossil replica, cast in durable Herculite plaster. All children will have their own fossil. Working like a scientist or museum artist, they bring out the details to aid understanding of the features. A wide range of fossils are available (up to 23), so at the end you can display them like a museum collection. Click here and here to see photos of children's work. 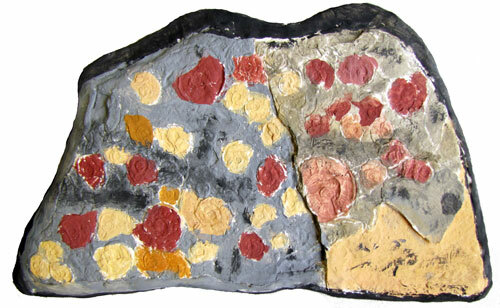 Below: fossils painted by Y4 girls. Click to see larger versions. Click here and here to see more. For the skeleton making in the afternoon, if you choose the skulls or T rex option, I will need some help over lunch to draw round the templates for the brown paper backgrounds. For this I will need 8 (perhaps older) children with black felt tips and scissors, as well as a large empty space. This should take about 20 minutes. Later, after the children have stuck on the bones, they will cut out the background shapes and piece them together. The main activity for the afternoon is making one or more skeletons or skulls of prehistoric animals. To introduce these animals we will look at photos of skeletons and reconstructions of these animals, and discuss what sort of animals they were. If you like we can discuss the various adaptive features of these animals, and compare them to other dinosaurs. For example, T rex had huge teeth adapted for crushing bone, as well as a large neck to support strong muscles for carrying a big head. There are 2 options for this activity: 1) make a life-size skeleton of a Tyrannosaurus rex (12mX4m), or 2) make three smaller skeletons (Deinonychus, Plesiosaurus, and Pteranodon - useful if you don't have space for the T rex). Details of each option are in the third column, here. Please note this is a challenging and time-consuming activity and not suitable for year 3s or some year 4s. 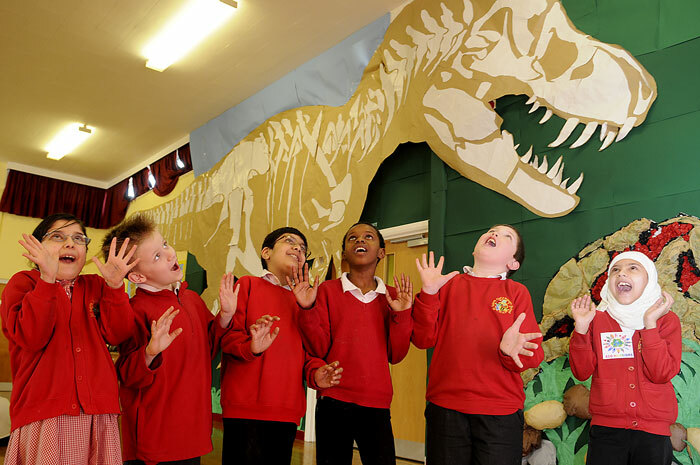 If you have any doubts, you can get a large number of older children (ideally year 6) and/or adults (perhaps parents) to help, or do the Fossils and Dinosaurs option instead. 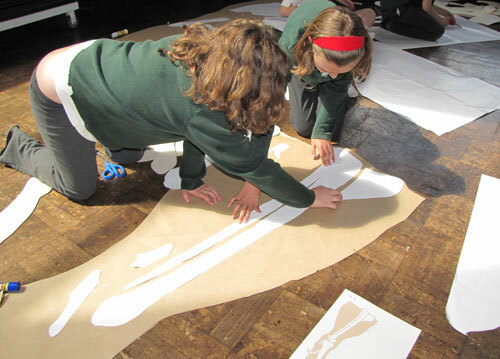 Children are divided into small groups and given materials (pencils, paper, stencils, scissors, glue) to cut out the bones of a dinosaur and stick them onto background shapes (made of brown wrapping paper). We will do this in the hall as a lot of space is needed. This activity is similar to a palaeontologist discovering scattered bones and trying to fit them together using a diagram of a skeleton. 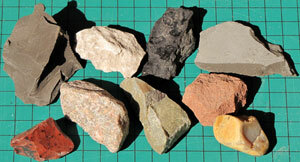 Look at pictures, videos and actual rocks to see 8 important types of sedimentary and igneous rocks and learn how they are formed. See a demonstration of sedimentation: two types of sediment, sand and mud, are mixed with water and left to settle in a jar of water. Children see the difference in rate of sedimentation, which results from grain size. In 8 groups children handle their own set of the same 8 rocks, and identify them with the aid of a hand lens and a descriptive guide. 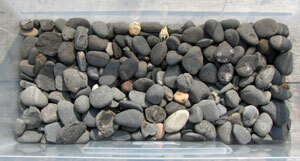 The rocks are: limestone, sandstone, shale, flint, coal, basalt, granite, obsidian. Refer to sedimentation experiment, and explain how fossils are formed in sedimentary rock. Look at 4 dinosaur fossils to show variety (vertebra, eggshell, tooth, dung). The fossil hunt and ID games take place concurrently - half the class does each activity then swaps. Children work in the same 8 groups as before. The activity will continue for about 30 minutes after lunch. Fossil Hunt: children search through boxes of rocks to find fossils, with the aid of photo guides. After 4 minutes they get a score based on one point per fossil, minus one for each non-fossil. There are four boxes, each of which has been collected from a specific location to illustrate the variety of fossils in the UK: Whitby Jurassic coast (ammonites, belemnites, shells); Welsh Carboniferous coral reef (corals, brachiopods, crinoids); New Hey Quarry Carboniferous plants and river bed (horsetails); Dudley Silurian coral reef (corals, trilobites, brachiopods). Fossil ID Game: Children choose from a collection of different species of one type of fossil - ammonites on one table, trilobites on another, and plants and corals on the others. Using a picture guide (see above) they identify the species. They then draw the fossil as accurately as possible. At the end the 4-6 children who do the most accurate drawings will get a free fossil. 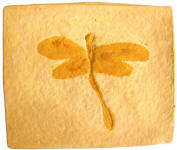 Click here to see some of the fossils in this activity. They are all genuine fossils. This may be the best time for children to buy fossils. I will need about 30 minutes to prepare for the afternoon activities. In the afternoon, after the fossil hunt and ID activities are over, I will need about 20 minutes to set up for the final activity. 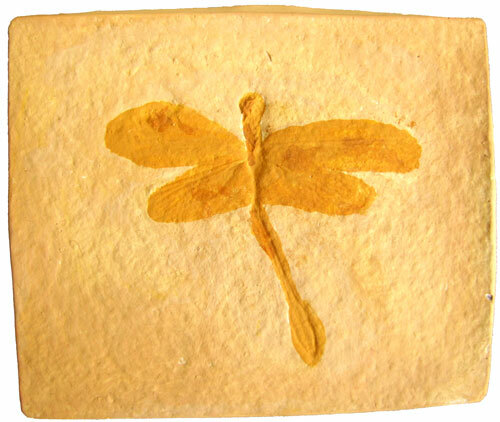 Children paint an accurate fossil replica, cast in durable Herculite plaster. All children have their own fossil. Working like a scientist or museum artist, children bring out the details to aid understanding of the features. 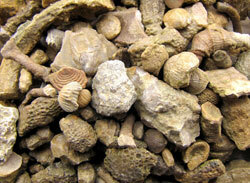 A wide range of fossils are available (up to 23), so at the end you can display them like a museum collection. Click here and here to see photos of children's work. Pteranodon in flight. This was a pterosaur, or flying reptile - not a dinosaur or a bird. All pterosaurs died out with the dinosaurs. Plesiosaurus catching a fish. The first Plesiosaurus skeleton was found in Lyme Regis by Mary Anning in 1823. Look at a model of a human skeleton and learn the names of the main bones, with reference to our own bodies. Look at a diagram of a dinosaur skeleton and see how they have similar bones, but adapted into different shapes and sizes. Play a game in which children identify the bones in a picture of a dinosaur skeleton. Children go round the room in the same teams as before, handling animal bones. From 12 to 20 bones are used, depending on the age of the children. Animals include cat, fox, bison, guinea pig, rabbit, sheep and goat. Click here to see the bones used in the lesson. Children try to identify (a) the type of bone and (b) which animal they came from, with the aid of pictures, and rulers to measure the bones. You have a choice of two activities for the rest of the morning session - the fossil game or the fossil painting. I will ask you which option you want when you book, to make sure I bring the right resources. These activities are described in the 'Fossils and Bones' section in the first column. Both activities are relevant to the theme of skeletons and bones. 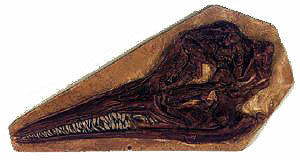 Many of the fossils are of bones, teeth, or complete skeletons. In the game the children can be asked to identify whether the animal is a vertebrate or invertebrate. Also you can use the fossils children paint to teach them more about skeletons, for example by getting them to identify and label bones in the Pterodactyl skeleton. For the Deinonychus, Plesiosaurus and Pteranodon, we will cut out the backgrounds during the afternoon session. However this is not possible for the T rex as this project is very large. I will therefore need the help of 8 children (perhaps year 5 or 6) over lunch break to draw round templates on brown wrapping paper. We will need black or brown felt tips and scissors, as well as a large empty space. This will take about 20 minutes. Later, after the children have stuck on the bones they will cut out these background shapes, so we can stick them together. The main activity for the afternoon is making one or more skeletons of prehistoric animals. To introduce these animals we look at photos of skeletons and reconstructions of these animals, and at some of the different sorts of bones in the skeletons. If you like we can discuss how the different bones were adapted for the animal's way of life, and how they are different in size and shape from our own bones, or those of other dinosaurs. There are 2 options for this activity: 1) make a complete Tyrannosaurus rex, or 2) make three smaller skeletons, of Deinonychus, Plesiosaurus, and Pteranodon (useful if you don't have space for the T rex). Details of each option are below. Please note this is a challenging and time-consuming activity and not suitable for year 3s or some year 4s. If you have doubts, you can either get a large number of older children (ideally year 6) and/or adults (perhaps parents) to help, or do the Fossils and Dinosaurs option instead. At the end the pieces are cut out and laid next to each other so children can see the complete skeleton(s). I can show teachers how to fix the T rex to a wall after school. This takes a while and requires step ladders (ideally two sets), but is well worth it! 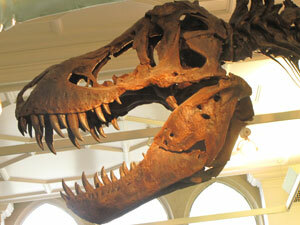 The Tyrannosaurus rex makes one of the most amazing displays you will ever have seen. However, it is 12m long x 4m high and so it is important to check you have available display space. If your hall is not long enough, the tail can be bent round a corner. Note that stepladders will be needed for fixing the dinosaur to the wall, as well as at least two adults. The advantage of this option is that children will be able to appreciate the enormous size of this famous creature. If however you do not have room, you can do the smaller skeletons instead. There are 3 skeletons, each of which require 8-12 children. The skeletons are: Deinonychus (the dinosaur that the Velociraptors in Jurassic Park were based on - real Velociraptors were smaller), Plesiosaurus (a sea reptile with a long neck), and Pteranodon (a large flying reptile). Click to see larger versions of the pictures below and left. Deinonychus as it would have appeared. Its feathers were not for flight, but for display and warmth. 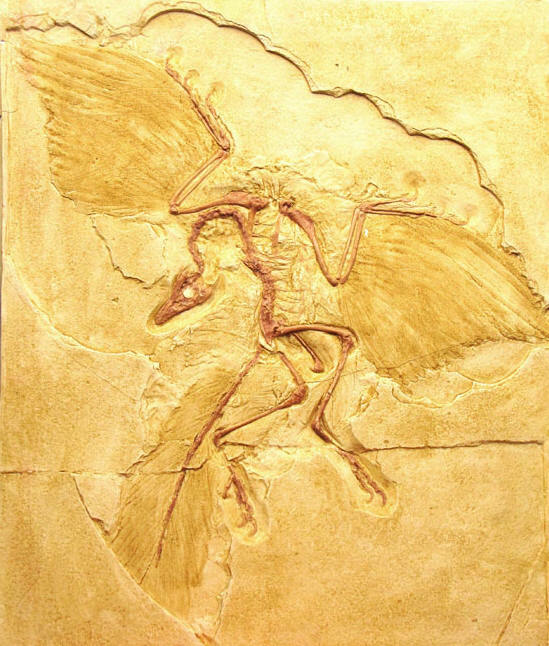 Like Archaeopteryx it is related to modern birds. These skeletons are smaller than the T rex (they range from 3 to 3.6m). This option therefore allows a school which does not have a lot of wall space to make complete skeletons. 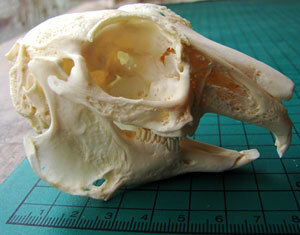 It is also easier in that the bones are already printed on cards, so the children do not need to draw round templates. On the other hand the bones are quite small and there are lots of them, so you still have a fairly complicated jigsaw puzzle (which is still much less difficult than the job of a palaeontologist, as in real life the bones are always broken into many pieces, and of course the puzzle is 3D!). This option is easier than Fossils and Bones, and allows younger or less able children to do a full day on dinosaurs. The morning session on fossils is the same, except that for KS1 a few of the more difficult fossils are omitted. In the afternoon, instead of making skeletons or skulls, the children will make full size colour pictures of prehistoric animals. 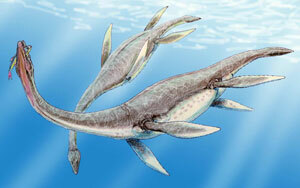 We have all seen paintings or models of dinosaurs and other ancient creatures, known as paleoart. But how accurate are these images, if all we have to go on are bones? Children will learn, with the aid of photos and models, how scientists build skeletons from fossil bones and add muscles and skin using their knowledge of animal anatomy. We will see evidence for skin texture from impressions in mud, and discuss what colour the skin might have been, by considering modern animals and their need for camouflage or display. 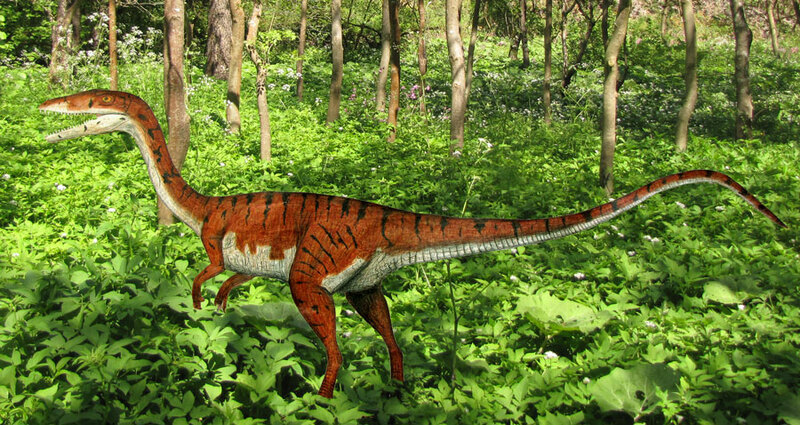 We will also see that many dinosaurs had feathers (e.g. Deinonychus, Velociraptor, maybe even T rex). There is recent evidence showing what colour these feathers might have been. To think about the colour and arrangement of the feathers, we will make a comparison with modern birds (which are descended from dinosaurs). I will briefly teach the children how to draw dinosaur skin textures, feathers, and other features such as eyes, claws and teeth. We will use crayons and marker pens. I will then explain the main activity, making dinosaur pictures. Children will get A3 line drawings of their dinosaur to try out ideas for colours and patterns. 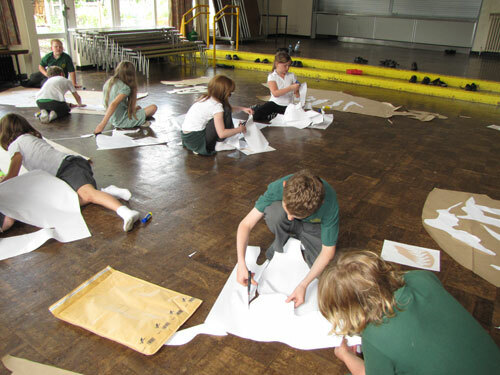 First children draw round templates onto brown paper. Options are given in the right hand column. Click the photos in the middle column to see larger versions. 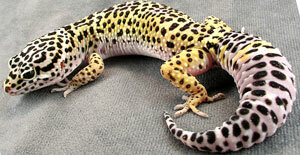 Second, children colour in the pictures, using marker pens (for outlines of scales, eyes, etc.) and thick crayons. A wide variety of colours are provided. Finally the pictures are cut out. The cutting out may be too difficult for younger children, so you can get adults to do this. The pictures can be displayed as they are, or stuck onto background paper and more details added, such as plants or ammonites. To inspire children they will have lots of pictures of the animals, as well as modern equivalents like birds, reptiles, and sea creatures, and images of fossilised dinosaur skin. 'I just wanted to thank you for the Time Trips fossil workshop. The two days were carefully planned and differentiated for our year 3 and 4 pupils. I really believed that the challenge of the skulls and dinosaur would be overwhelming but you managed to get the best out of them in a calm and relaxed manner. 'I can highly recommend this workshop! What a brilliant time our girls had learning about Bones and Fossils! Tony brought an ideal mix of high scientific knowledge and challenging fun to the proceedings, all presented in a calm, precise manner. The girls loved the team games where they had to use their mathematical and deductive skills. Fossil painting was really popular and the results make a stunning display. 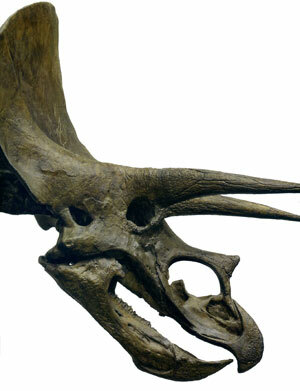 The highlight of the day has to be the life sized Triceratops. The children really enjoyed the session - particularly the quiz - I was surprised by how motivated they were!!! The painting session went well and it was great that the fast finishers had some other fossils to move on to whilst they waited for those who took more care and had better concentration. 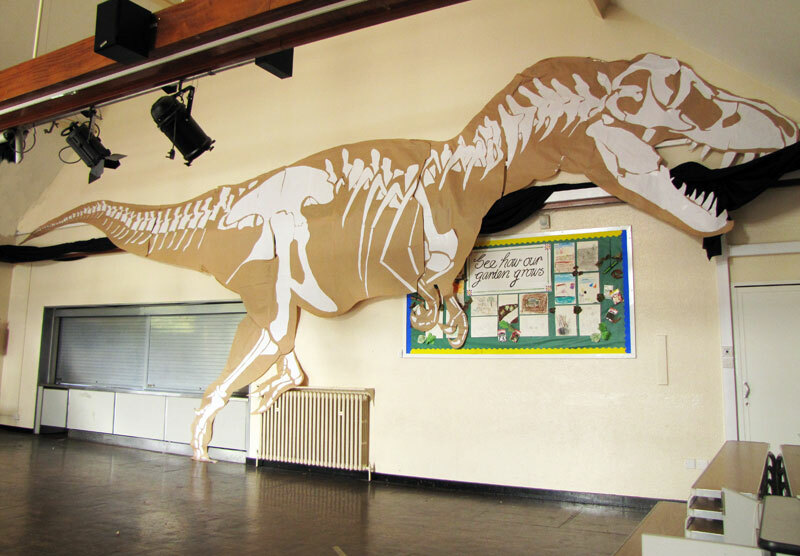 'The children at our school were amazed to arrive one morning in the last week of term to see a life-sized Tyrannosaurus rex prowling across the back of our school hall. This beast had been put together the previous afternoon by children in Year 4/5 as part of a workshop delivered by a regular visitor to our school, Tony North. In the past Tony has delivered engaging and hugely popular curriculum workshops on historical topics but none of us were quite ready for his latest idea. 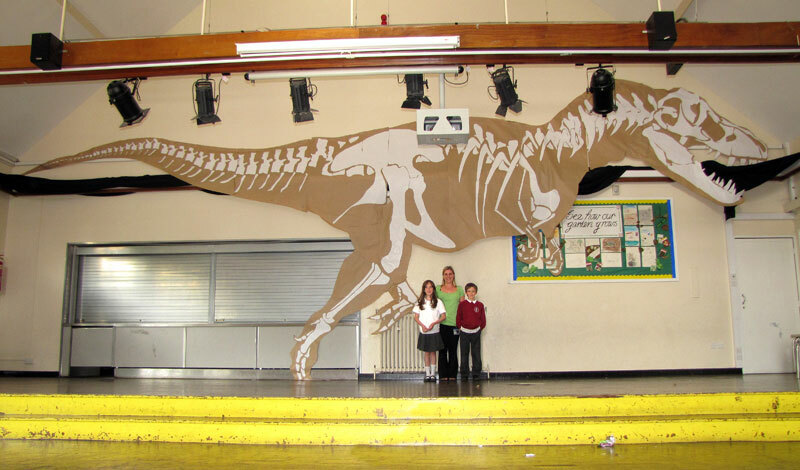 Following a useful classroom presentation on the skeleton, Tony took the children into the hall where they worked for the rest of the afternoon as paleontologists slowly uncovering the remains of an enormous prehistoric dinosaur. 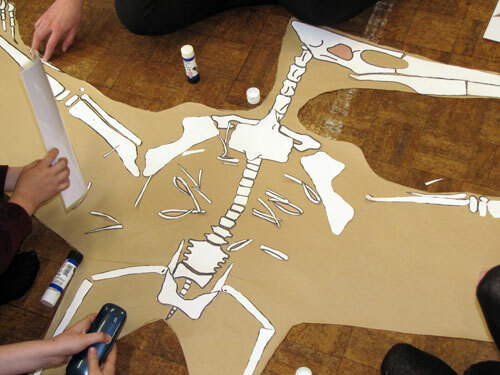 In small groups, differentiated according to the ages and abilities of the children in the class, they drew from stencils, cut out and assembled a myriad of paper bones which were then arranged to form the dinosaur skeleton. I was impressed with the level of engagement the children showed on a complex and demanding task over a lengthy period. They also worked cooperatively, both within the small groups working on different parts of the dinosaur and as a class piecing the parts of the whole together.